This is a collection of different views of Mumbai. 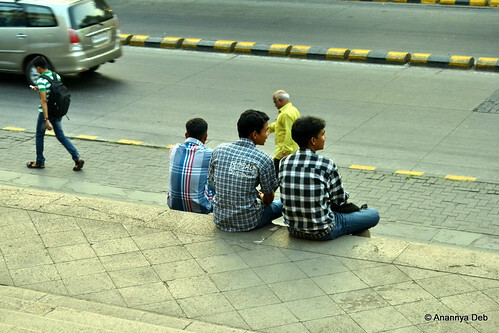 Unlike most photo essays of Mumbai, I am quite happy to go into the suburbs and take pictures. This, for example, is a picture from one of the sets in the collection – Public Spaces. 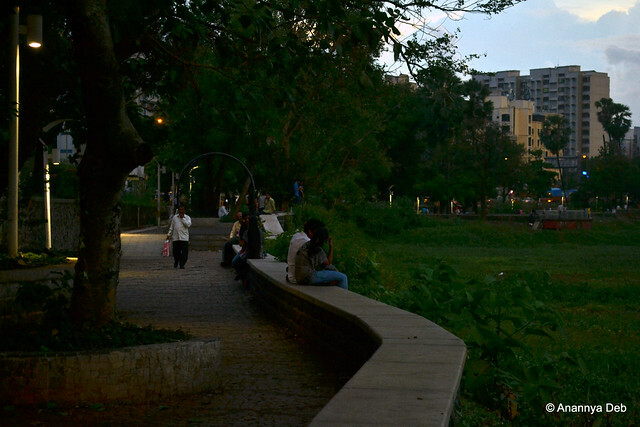 The Powai lake and the area around it was, till a few years ago, part of the extended forests that are now fall under the Sanjay Gandhi National Park. That leopards and panthers still stray into these areas gives you clues about the loss of habitat of these biggish cats. So this promenade around the shore of the lake is, in a way, the edge between new age urbanisation and the legacy natural habitats of wild life. 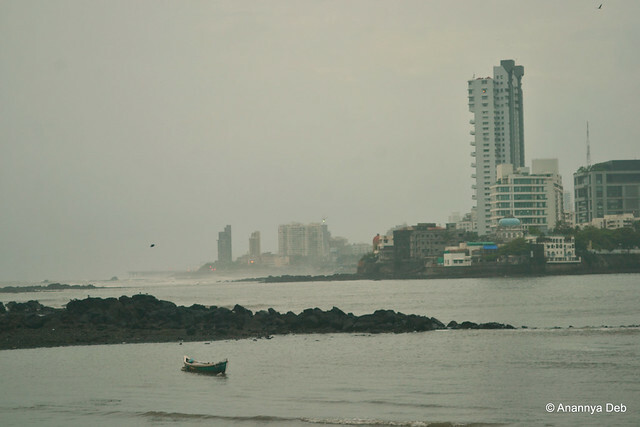 The waterfronts of Mumbai, whether sea facing, lake facing or creek facing, are the most expensive chunks of real estate in the city (and possibly in the country). The creek side is still underdeveloped because of the mangroves and the general lack of interest of anyone to find an economic model to drain those swamps and put up high rises. However, as a public space, the swamps / mangroves do not fail the citizen nor other animals. The Sewri mudflats fall on the wintering migrations of the pink flamingoes. But iconised in Hindi films and a part of every citizen’s life whichever part of the city he or she may be from is the sight of the Arabian Sea falling over the western promenades from the Gateway of India up to Versova during the monsoons. On a clear day, the tail end of the Bandra-Worli Sea Link can be discerned. In the midst of heavy rain and general lack of visibility, in the picture above, all one can see is a faint greyish smudge behind 5 foot high white surf. And I think the city needs more of such touch ups to the walls on the streets. 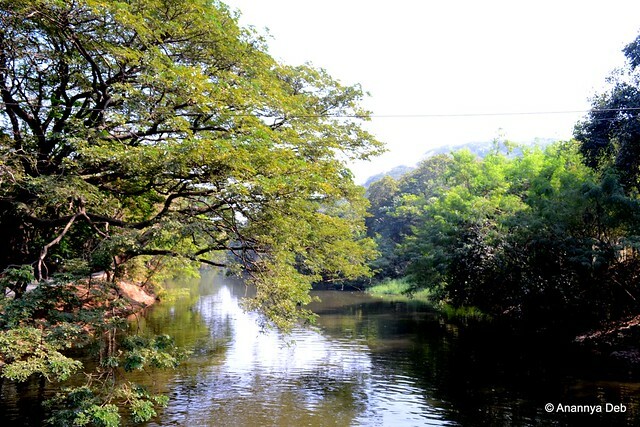 There’s a rare unpolluted part of a river flowing within the municipal limits of Greater Mumbai. So there are photo walks happening all the time, some in groups while others done as individual journeys. Then there are photo sits, actually. You just sit down in one place and shoot the area around. I have been lax in this regard. So far, my photography has been restricted to broadly three categories – travel, official documentation (meetings, workshops, other things at work) and ethnography. The last one involves, obviously, people. However, I have rarely posted these photos on line. There is a certain diffidence to putting up photos of people online in public forums. However, I was much inspired by this set by Ruxandra, a photographic study of people walking around, sitting, etc. in Alexanderplatz in Berlin. So, I thought, why not. The iconic Town Hall of Bombay, which also houses the Asiatic Society of India and its library, has a flight of steps which have been made famous in pictures and movies. Sitting on the steps is quite the cool thing to do if you are there. 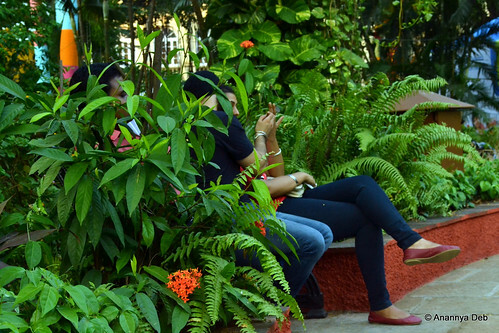 Right opposite the Town Hall is the Horniman Gardens, a piece of open space that is ravenously consumed by the space-starved Mumbaikar. 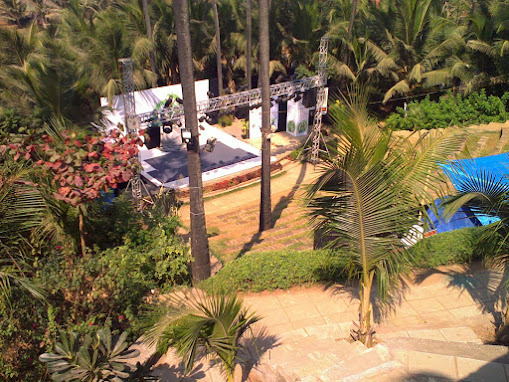 So when any event is announced, it is often packed and bustling with life and energy and paradoxically, peace, quiet and privacy! Now for some more walking around and sitting around. 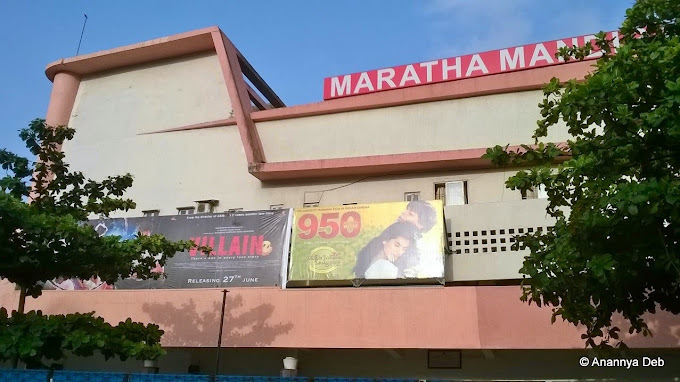 Just 6 years back, I had been a regular at single screen theatres given that there was one 500 metres from my house in Chembur. But then it was sold off and the new buyers did what is the standard norm – tear it down and build a mall with a multiplex. The construction is still on at this place and I have no idea when it is likely to become operational. Of course, the implications are clear – from paying Rs 30 for a ticket to paying Rs 250 per ticket (irrespective of the quality of the film). This piece on the old single screen cinema houses in south-central Mumbai evokes many memories and nostalgia. For Rafique Baghdadi, a film and music buff and social historian, the theatres of this area still stand as photographic landmarks in his memory: “There were around 19 theatres within that 1-mile radius. 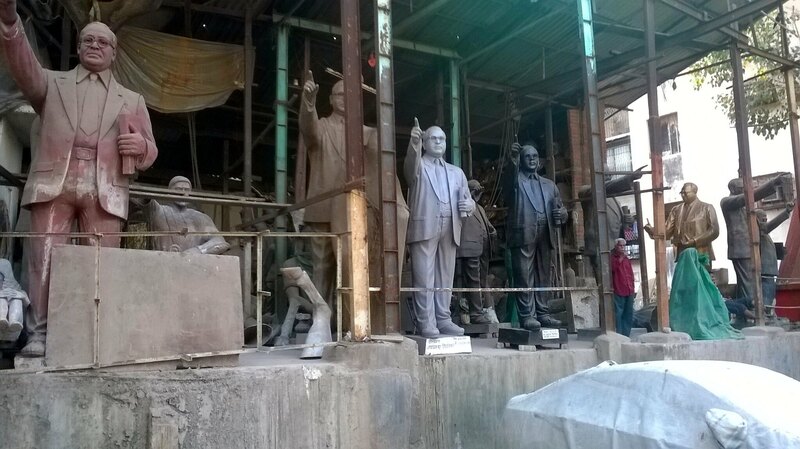 You start in Girgaon with National (now Moti Talkies), also once Dargah Talkies, go up the road to Kamal (now the recently defunct Alankar); on the left is Silver, then comes Gulshan, New Roshan and you end with Alfred (once Ripon). Opposite Alfred was Victoria, which was renamed Taj Talkies before being razed. Further down, near the Parsi Fire Temple, was Daulat (which does not exist any more). 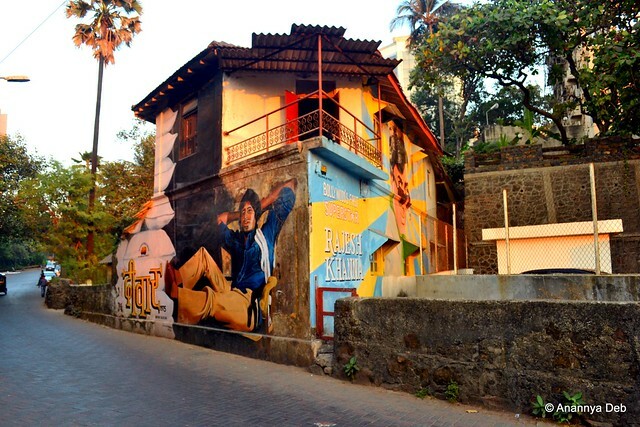 Daulat was originally the Baliwala Grant Theatre, owned by the great comedian Khursetji Mehrwanji Baliwala. Further down what is now Maulana Shaukat Ali Road was Royal, and opposite it is Nishaat. Down the road, towards Grant Road Station end, begins Shalimar, opposite which are Super and Novelty. Take the left and you will come to Imperial, Naaz, Swastik, Majestic (where Alam Ara was screened and which does not exist any more), Lamington (now Apsara), Minerva (now a hole in the ground) and Dreamland (once Krishna),” says Baghdadi. Okay, need to find a holiday day off and go photo-walking in this area. The hardened Mumbai manoos does not have time for the trivialities of nature like a sun set. What’s so special about a sun set? It happens everyday no! Till evening came as the seminar wore in this Juhu hotel. The need to stretch one’s legs and catch some breadth (dum) took us out to this scene. Camera handily available. And so photo happened. Who Makes All These Lists? 10 places to halt for a bio break on a road trip from Mumbai to anywhere: Ok, the men can do it behind the trees. What about the women? In a bus trip to Goa, late at night, in the middle of a jungle, some ladies in the bus needed a break. The driver told them to hold on till they reach some town. The ladies said they couldn’t. So the bus driver had to stop. Off the women went behind the bushes. 10 places that don’t look like VT station in rush hour: The problem with many places around Mumbai is that all of Mumbai lands up there on weekends and holidays. The same crowd you want to avoid is there, ordering pav bhaji, listening to Munni, creating a traffic jam, etc. Really, one needs some escape. 10 places where you can just land up: Ok, I may be the only subscriber to the list for the simple reason I hate doing advance reservations and bookings and like. It kind of “restricts” me. I like to just land up and size up the place and then decide. The economics of the travel business are such that this “landing up” strategy becomes quite expensive. Of course, one has kind of become adept at finding out the cheap places and the last few trips I made on similar lines, one did come back with the wallet well preserved. Of course air travel (and possibly rail travel) become nonviable in such strategies. I shall share some of them in due course.